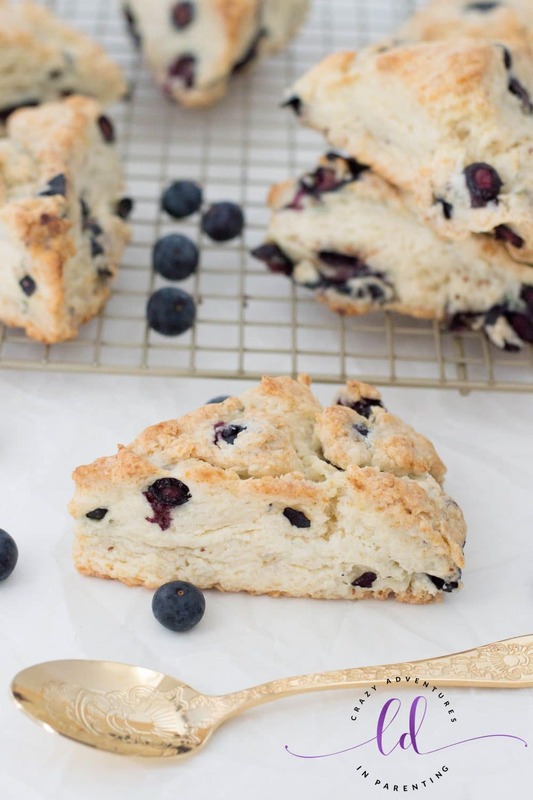 A gorgeous Blueberry Scones recipe like this, made with fresh blueberries, heavy cream, and only a handful of other ingredients, should be celebrated and devoured, don’t you think? I LOVE SCONES! (I said it in all caps to properly convey my total adoration and worship of the mighty scone.) What about you? I mean, what’s not to love about scones? They’re not cake, cupcakes, or bread.. but they’re these little rounded triangles of happiness and always so delicious no matter where you enjoy them. We made Strawberry Scones recently and now, with spring temps and fresh produce available, I had to try making these Blueberry Scones as well, especially since we’ve got quite a few blueberry lovers in this household. Look at those gorgeous blueberries in those scones! Gah! We totally lucked out when we went to the store, we got such GORGEOUS blueberries, almost oversized ones! We snacked on a few to gauge their flavor (you know you HAVE to taste test fruit before baking with it, ahem) and man, these sure packed an incredible punch! This perfect scones recipe that beautifully integrates any of your favorite fruits + these farm fresh blueberries makes this Blueberry Scones recipe a truly special one to make for your family! As a mom to eleventy billion kids, our large family needs easy recipes. I do my best to serve you the best recipes on the web by creating easy breakfast recipes that require minimal steps to achieve meal greatness, you know? I hope you appreciate that as I do, easy recipes are my jam! But seriously though, just like my Strawberry Scones were, these easy Blueberry Scones were an absolute delight to prepare with my kids! Just mix, bake, and serve! One of the things I love most about this recipe and our other scones recipes is the potential for bulk baking these in advance for easy breakfasts. One typical batch of these serves eight people, but you could easily double or triple and set yourself up breakfast-wise for days! Or, if you’re expecting a larger crowd or going to a potluck brunch, these easy Blueberry Scones would be a wonderful recipe to make to bring with you and serve! I firmly believe that recipes don’t have to be complicated to taste amazing, you know? 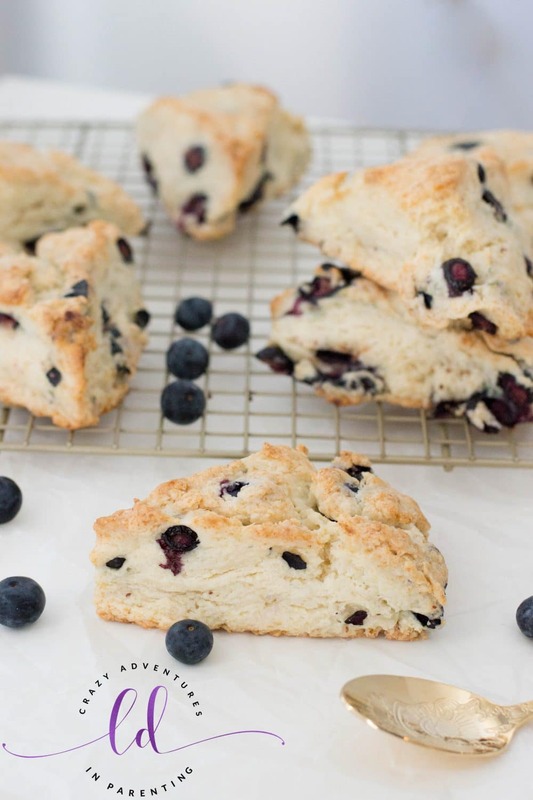 That’s why this simple Blueberry Scones recipe is made with a minimal amount of ingredients! You don’t need a ton of them and eleventy-billion steps in order to make something this incredible for your family to enjoy for breakfast or brunch! This easy blueberry scones recipe hits the spot all while taking you not even thirty minutes to make! Gather the kids around for this one, have ’em wash their hands, roll up their sleeves, wear an apron (so the flour or sugar doesn’t get on their clothes), and get the kids in the kitchen baking these homemade Blueberry Scones alongside you! I am a HUGE believer in getting the kids in the kitchen beginning at a young age. The earlier you start cooking with kids, the easier it’ll be as they become young adults to cook their own meals, prepare their own food, and be 100% comfortable taking care of their own meal needs once they leave the “nest,” you know? Use a sifter to sift your dry ingredients, particularly the flour. This ensures the ingredients will blend completely and leaving you with a better, well-mixed final product. Using very few ingredients to make this incredible recipe, I recommend using unbleached all-purpose flour, real butter (Kerrygold is the best), and fresh organic blueberries. Gentle hand-mixing using a wooden spoon in this recipe is preferred, no electric mixer needed. Use care when mixing the ingredients to not pop the fresh blueberries upon stirring. To add a little something magical at the end, baste your freshly prepared Blueberry Scones with butter and sprinkle gently with granulated sugar to make them sugar-topped. It’s so delicious when served this way, and it adds a little something special! Preheat oven to 400 degrees F and Line a baking sheet with parchment paper (or reusable silicone baking mat) and set aside. Set aside. Rinse and dry your fresh blueberries and set aside. In a large bowl, sift together dry ingredients: flour, baking powder, salt, and sugar﻿. Using a pastry cutter, blend butter into dry ingredients until crumbs start to form. Fold in your freshly washed fresh blueberries, being careful not to pop any blueberries. Form a well in the middle of the ingredients and pour in heavy cream, ½ cup at a time. Mix until a dough forms, being careful again to not pop any of the blueberries. Pat dough onto a baking sheet, forming it into a flat circle about 8 inches in diameter. Cut dough with serrated knife or pizza cutter to create 8 triangular shapes. Separate triangles from each other and re-place gently on lined baking sheet. Bake for 15 to 20 minutes and allow to cool for 5-10 minutes on a wire rack. Serve and enjoy! Are they not absolutely gorgeous? My mouth is watering just looking at all these pictures again! Full recipe with measurements is below! I hope you’ll consider pinning and sharing this Blueberry Scones recipe! Be sure to also check out my Strawberry Scones recipe as well as my other breakfast recipes, too! Be on the lookout for more blueberry recipes coming soon, too! And be sure to check out my good friend Mel’s Blueberry No Bake Dessert! 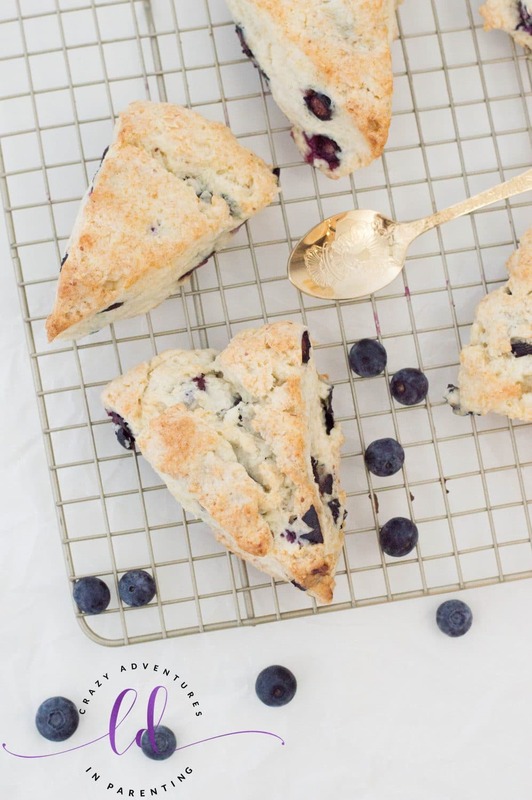 A gorgeous Blueberry Scones recipe like this one should be celebrated and devoured accordingly. Preheat oven to 400 degrees F and line a baking sheet with parchment paper. Set aside. Rinse and dry your fresh blueberries and set aside. In a large bowl, sift together dry ingredients: flour, baking powder, pinch of salt and sugar. Fold in your freshly washed fresh blueberries. Form a well in the middle of the ingredients and pour in heavy cream, ½ cup at a time. Mix until a dough forms, being careful to not pop any of the blueberries. Pat dough onto a baking sheet, forming it into a flat circle about 8 inches in diameter. Cut to create 8 triangular shapes. Separate triangles from each other and re-place gently on lined baking sheet.